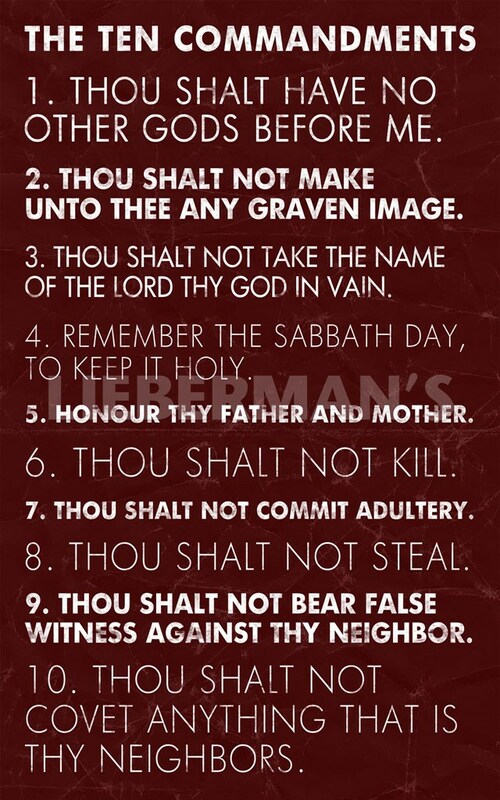 The Ten Commandments: 1. Thou shalt have no other gods before me. 2. Thou shalt not make unto thee any graven image. 3. Thou shalt not take the name of the lord thy god in vain. 4. Remember the sabbath day, to keep it holy. 5. Honour thy father and mother. 6. Thou shalt not kill. 7. Thou shalt not commit adultery. 8. Thou shalt not steal. 9. Thou shalt not bear false witness against thy neighbor. 10. Thou shalt not covet anything that is thy neighbors.